However, I do use the preseason to get a handle on how coaches view their depth charts. The easiest way to do this is by not following what they say, but instead watching how they use players. By tracking first-string usage, we can quietly learn a ton as we continue to get set for Week 1. Meanwhile, the “preseason is meaningless crowd” will fall behind. Below are the usage notes I found most important after the third week of preseason action. The Week 1 recap is here and the Week 2 recap is here. 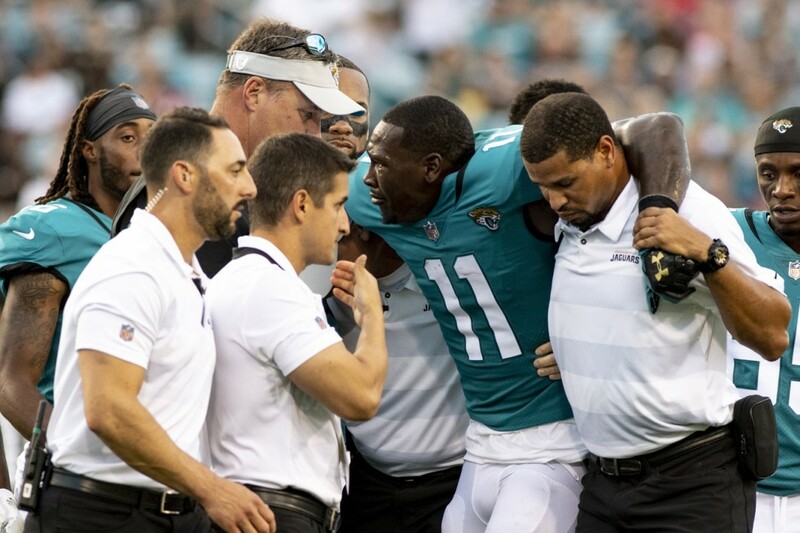 The Jaguars lost Lee (knee) for the season four snaps into Saturday’s preseason game. The first-stringers played 40 snaps after that, and here are the WR snap counts: Donte Moncrief 32, Keelan Cole 28, Dede Westbrook 26 and DJ Chark 14. As you can see, this wide receiver room is still crowded even after we remove Lee. I think it’s important to note Cole was running opposite Lee as the starter and primary in 2-WR sets before the injury. After the injury, Moncrief simply stepped into Lee’s role and Westbrook remained in his “slot-plus” role. Chark is the rotational fourth option. It’s going to be tough to pinpoint which of the top three will be the best play each week, especially on a team that ranked 21st in raw pass attempts last season. My first lean is toward Cole, who has a primary role secured and proved he can be a load-bearing wideout as a rookie last year. In the four games between Weeks 13 and 16, he went off for 19-442-3. 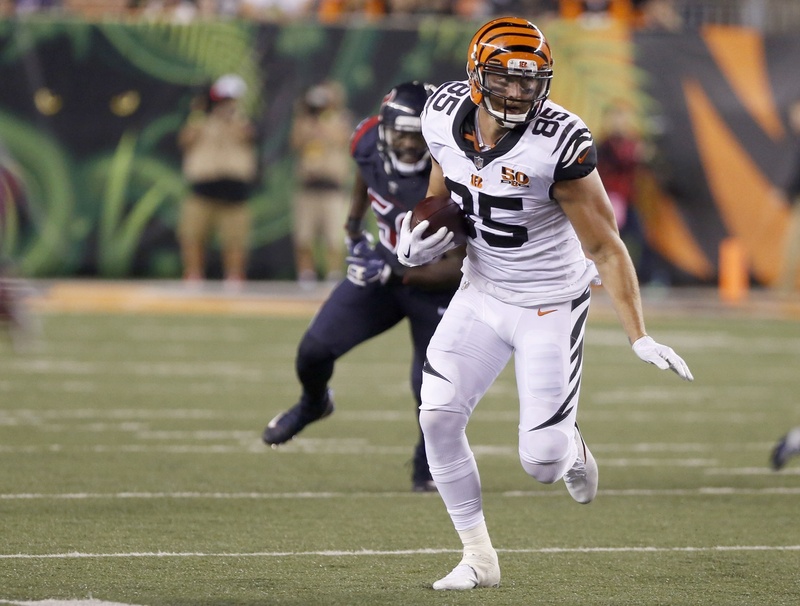 At this point, the Bengals realize they can’t ask the oft-injured Eifert to be an every-down player. He’s appeared in just 10 games over the past two seasons and missed a whopping 40 over the past four. But the tight end is still healthy enough to contribute on a part-time basis, and OC Bill Lazor is smart enough to tailor those snaps for Eifert’s strengths. That means being a dominant receiver over the middle and in the red-zone. Don’t forget Eifert scored 18 touchdowns in 21 games across 2015 and 2016. So it was exciting to see Eifert run 13 pass routes, pass-block zero times and run-block once on Sunday. Yes, he only played on 14-of-26 first-string snaps, but we don’t need him out there on running plays anyway. Expect Eifert to be used heavily in the red zone and on clear passing downs, where the Bengals quietly are loaded. A.J. Green remains elite, Gio Bernard is a strong pass-down back, John Ross is a big-time breakout candidate, Joe Mixon has been making plays while lined up as a wideout this preseason and Eifert appears healthy. Andy Dalton at $5,800 against the Colts will be in play for GPPs at Indy Week 1. Like a lot of people, I had major concerns about Ridley as a prospect as noted here. He simply does not have the athletic profile of an elite fantasy wide receiver. It’s extremely early, but perhaps those concerns are turning into reality. 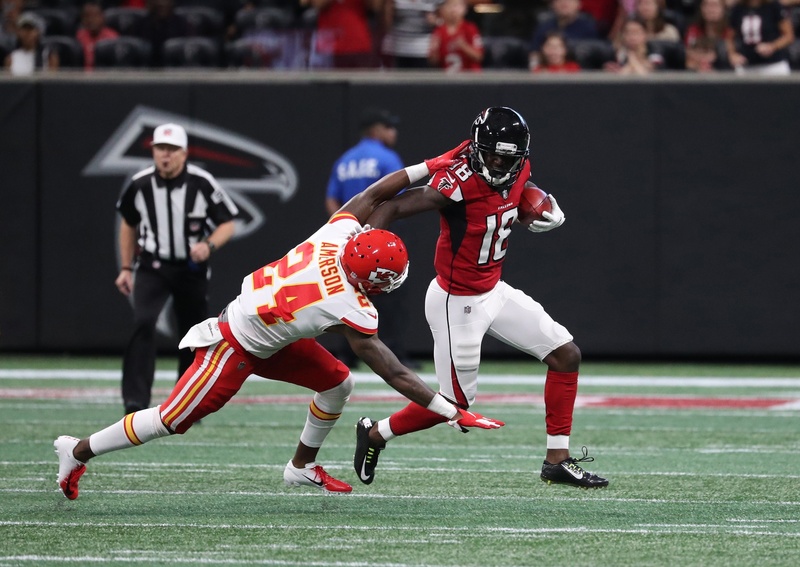 Matt Ryan played 26 snaps Saturday, and Ridley was only on the field for 16 of them — even though Julio Jones rested. Mohamed Sanu led the way with 21 snaps, Reggie Davis got 16, Russell Gage got eight and Justin Hardy got seven. Whispers that Ridley would overtake Sanu for the No. 2 WR role immediately appear far-fetched at this point, and the No. 3 spot is unlikely to be a reliable fantasy contributor. Jones, Sanu, Devonta Freeman, Austin Hooper and Tevin Coleman are going to soak up a lot of usage. 4. Sammy Watkins, expensive decoy? The No. 2 role in the Chiefs’ offense has long been a dead spot. Demarcus Robinson, Albert Wilson and Chris Conley are some names that have been simply placed out there to run clear-out routes. They’re rarely part of the top-three reads for the quarterback on a play. But when the Chiefs gave Watkins a jaw-dropping three-year, $48 million contract with $30 million guaranteed in March, I thought it would be different. I thought Andy Reid would have big plans for Watkins. Maybe they still do, but the preseason hasn’t been encouraging. Watkins has played 67 first-string snaps and produced 1-14-0 on seven targets. 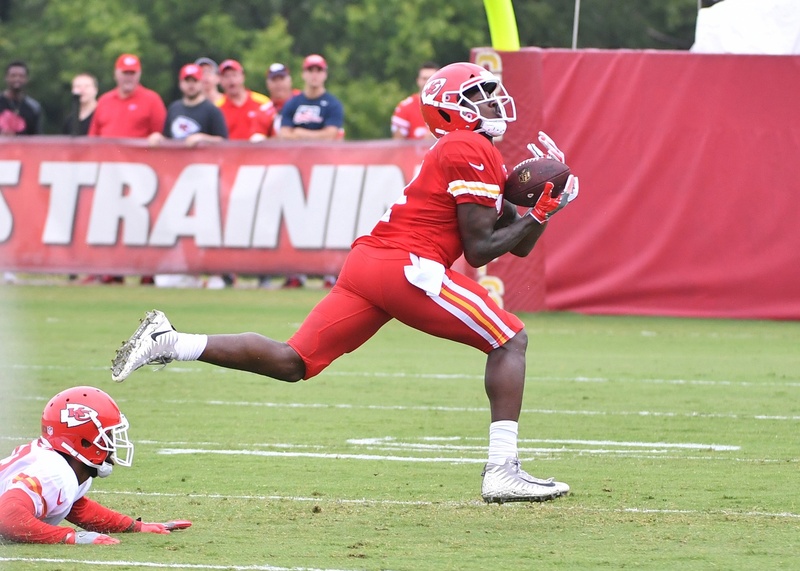 Tyreek Hill has played 64 first-string snaps and popped off for 14-182-1. I suspect the Chiefs will want Watkins to be more involved than Robinson or Conley were, but it’s clear he’ll be behind Hill, Travis Kelce and Kareem Hunt in the pecking order. The Broncos severely lacked a No. 3 wideout over the past few years, forcing Demaryius Thomas and Sanders into big target shares as outside receivers. That’s changed this year with the emergence of impressive second-round rookie Courtland Sutton. He’s been a fixture on the outside as the Broncos are going with a 3-WR base, pushing Sanders into the slot role. As noted by Pro Football Focus’ Pat Thorman, Sanders’ preseason slot rate is up to 64 percent after sitting down at 26 percent last regular season. We know the slot is where a ton of fantasy points are found, particularly in full-point PPR formats like DraftKings. We also know Case Keenum favored throwing to the slot last season in Minnesota, as he attempted 59 percent of his passes there. Sanders remains a strong Week 1 target at just $5,000 against a drastically weakened Seahawks defense. Last week, I detailed the strange usage of Taylor in the second preseason game. I was hoping that was just a one-week blip and Taylor would be in the No. 2 WR role in the third preseason game. It didn’t happen, as Taylor was in on just seven of Marcus Mariota’s 19 snaps. Top wideout Corey Davis got 18, Tajae Sharpe got 12 and Nick Williams got nine. Note that Taylor has been in on just eight of Mariota’s past 31 snaps — and that’s with Rishard Matthews (knee) sitting. Now Matthews is off PUP and hoping to be ready for Week 1 at Miami. Rostering Taylor in Week 1 isn’t totally insane, but it requires a big leap of faith for people aware of his preseason usage. Powell started the preseason opener and got the first five RB touches. Crowell (concussion) didn’t play in the second preseason game, but Powell’s usage was again impressive. As noted by PFF’s Scott Barrett, Powell was split out wide on five of his 13 routes through two games and has been in on 24-of-27 first-team snaps overall. Crowell was back for the third preseason game Friday and proceeded to get out-snapped by Powell 24-9. Perhaps the Jets wanted to ease Crowell back in off the concussion, but it \ appears likely Powell will be the 1A here. And that’s notable, as he’s produced consistently whenever he’s gotten opportunity. Powell has never averaged less than 4.0 yards per carry in his career and has piled up a strong 128 catches in his past 1,296 snaps. Freeman has been one of the preseason’s most impressive players, rushing 15 times for 84 yards with three touchdowns. He’s clearly the superior early-down option to Devontae Booker, who has generated just 911 yards on his first 253 NFL carries. However, the Broncos are making Freeman sweat it out just like any other rookie. In the first half of Friday’s third preseason game, Booker started and played 14 snaps. Freeman was next with 11 followed by Phillip Lindsay with eight. 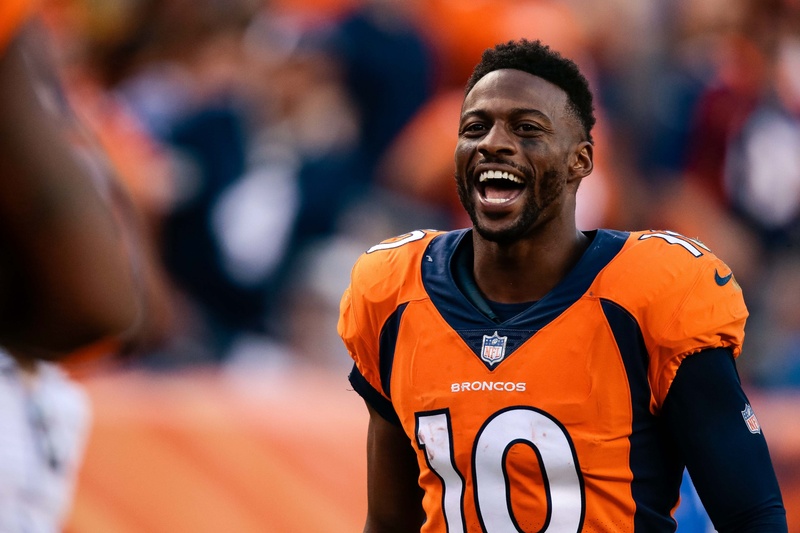 Freeman’s superior talent is very likely to get him the lion’s share of work on early downs in Denver, but it might not happen right out of the gate. It’s tough to be optimistic on a 33-year-old tight end less than one year removed from a foot fracture. But it’s notable that Olsen looked very healthy as he was in on 31-of-33 first-string snaps Friday. Overall, he’s recorded a 5-49-0 line on 60 preseason snaps. Olsen certainly has competition in the target share department after D.J. Moore was added to an offense that already featured Christian McCaffrey and Devin Funchess. But Olsen still is going overlooked relative to his 2014-16 campaigns, which saw him post at least 77 catches and 1,008 yards each season. Marlon Mack (shoulder) remains questionable for the Week 1 home game against the Bengals. Even if he’s out, we can’t expect much clarity in the Colts’ backfield. Fifth-round rookie Jordan Wilkins started Saturday but only played on 9-of-28 first-string snaps. Nyheim Hines got eight snaps and Christine Michael picked up the final 11 with Andrew Luck under center. With coach Frank Reich almost certain to employ a committee and the Bengals quietly strong up front, this situation is an easy avoid for me. The wide receiver situation in New England has grown dire. We knew Julian Edelman was suspended for four games, Brandin Cooks signed with the Rams and Danny Amendola signed with the Dolphins. But most assumed the Pats would drudge up a diamond in the rough — either in the form of a free-agent add, trade or in-house option. It simply hasn’t happened. Kenny Britt was cut, Jordan Matthews was released with an injury settlement, Macolm Mitchell was cut, Eric Decker retired 23 days after being signed and sixth-round rookie Braxton Berrios hasn’t flashed. It leaves the Patriots with Chris Hogan as the undisputed No. 1, Phillip Dorsett as the No. 2 and Cordarrelle Patterson in a return-man/gadget role. We safely can expect a ton of 2-TE formations from Bill Belichick and also plenty of running back targets. James White and Rex Burkhead are both capable of lining up in the slot. Dorsett, meanwhile, is likely to be out wide in the low-upside, clear-out role. He played 66 snaps this preseason but posted 5-40-0 on nine targets. Deshaun Watson played 27 snaps this preseason, and Miller was on the field for 26 of them. It’s not a surprise as D’Onta Foreman (Achilles) careens toward the PUP list, but it is notable after Alfred Blue stole so many snaps from Miller late last year. A three-down plus goal-line role in today’s NFL is hard to come by, so even though there are plenty of warts in Miller’s outlook (dreadful offensive line, shaky efficiency), there’s still a nice floor/ceiling combo here. Watson’s mobility will help Miller, who averaged 14.9 fantasy points per game with Watson last year vs. 9.9 without. The Panthers aren’t one of the teams that prioritizes resting its key players. They played the third preseason game like a regular season game, even with Cam Newton running around and landing on his head. Of course, that meant a huge workload for McCaffrey — similar to what we saw in the first two preseason games. In the first quarter alone Friday night, CMC racked up 10 carries and a target. Overall for the preseason, he’s been in on 59-of-66 first-string snaps while C.J. Anderson has been in on seven. Armed with a skillset optimal for today’s NFL and a full-PPR format, McCaffrey is one of the most underpriced running backs in Week 1 at $6,400. Njoku’s preseason of impressive usage is a wrap. He finished with 62-of-72 first-string snaps and ran 36 routes vs. nine pass-blocks. The athletic specimen turned that usage into a 6-71-2 line and now turns his attention to the Steelers in Week 1. Njoku ($3,400), Jordan Reed ($4,000) and Jack Doyle ($3,600) are all very much in play as salary-savers at the tight end spot. Everyone expected a relatively even timeshare between Henry and Lewis, and that’s what we’ve gotten. Henry continues to run as the “starter” and appears to be the preferred option in short-yardage, while Lewis is clearly the man in passing situations. Via Graham Barfield, Lewis was in on 22-of-40 first-string snaps this preseason while Henry got 19. Lewis got eight third-down snaps compared to just two for Henry. We can expect similar splits and matchup-dependent usage from the Titans this season, which will lead to a wide range of weekly outcomes. Touchdown chasers certainly should lean toward Henry. Carlos Hyde once again started Thursday in the Browns’ third preseason game. He ended up playing on 20 first-half snaps vs. 19 for Duke Johnson and one for Nick Chubb. A closer look, however, reveals a clear picture of roles. As noted by PFF’s Nathan Jahnke, Duke was in on 14-of-15 snaps in 3rd-and-medium, 3rd-and-long plus two-minute drills. Hyde was on for 19-of-25 snaps in all other situations. Game flow clearly will play a factor here, much like it will in Tennessee. When the Browns are playing from behind and find themselves in a lot of passing situations, Johnson will be featured. Base formations will feature Hyde. Chubb has a lot of ground to make up.